Everything moves slowly, as one might expect with wee children (I suspect the summer might be even more complicated to get work done, but there you go), but here is the opening of a short story I’ve been working on this week. Who knows when it might be completed? Some of these have taken upwards of eight months. But I’m curious to see where this one might end up. Further of my short stories from the same manuscript-in-progress, “On Beauty,” can be seen via my author page, here. 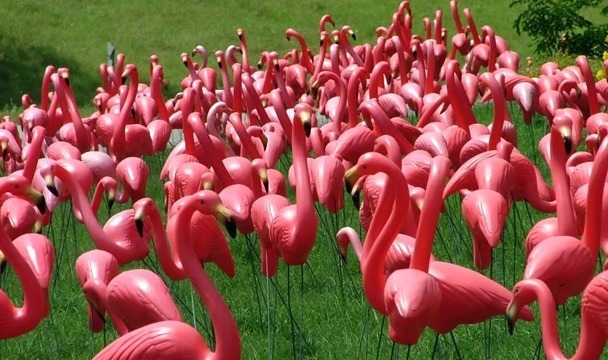 Thirty-eight plastic flamingos appeared on Jennifer’s front lawn. She just opened her front door, and there they were. She had no idea why. It wasn’t her birthday, or anniversary. She hadn’t graduated anything, been promoted, or won an award. Thirty-eight plastic flamingos, and how she stepped through the crowd on her way to her car. On her way to work. She took photos, of course. She mentioned the flamingos to co-workers as a curiosity, moving further to friends, her parents, anyone she could think of, slowly discovering that there was no-one willing or able to take credit. It really was the oddest thing. The flamingos remained on her lawn at the end of the day, and for the following few days, and still, there was no note, email or other kind of acknowledgment as to who might have put them there, or why. Busy with the intricacies of life, she hadn’t the time to dig any deeper into the question. Flamingos, on her lawn. Thirty-eight. Why thirty-eight?